Enjoy a FREE up size on Serenitea's signature Chaffee drinks for an up sized boost in energy and motivation every Monday! 1. Promo dates: January 8, 15, 22, 29 and February 5,12,19,26, 2018 only. 2. 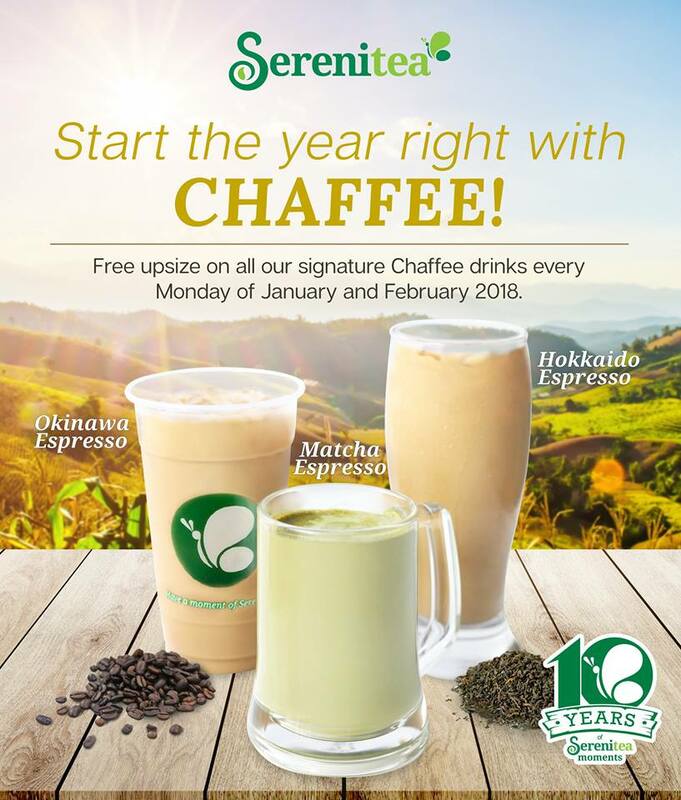 Beverages applicable in this promo: Matcha Espresso, Hokkaido Espresso and Okinawa Espresso. 3. All orders of Chaffee, hot or cold, will automatically be upgraded from Medium Size to Large Size. 4. Applicable for dine in and take out orders, not valid for delivery transactions. 5. This promo is not valid in conjunction with other discounts, privileges and promos. 6. Valid in all branches, except for stores in Cebu and Tacloban. 7. On the purchase of goods and services which are on promotional discount, senior citizens can avail the promotional discount or the discount provided under the Expanded Senior Citizens Act of 2010, whichever is higher.